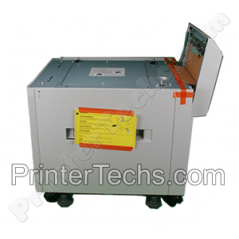 Refurbished feeder for HP LaserJet 8100 , 8150 series printers. This product gives you an extra 2000 sheet capacity for HP LaserJet 8100, 8150 series printers. NOTE: Feeder only, does NOT include data connection cables. Please note this is a large item. We prefer to ship it on a pallet via freight truck (average cost to a destination with a loading dock is $130 for shipping). If a loading dock is unavailable we can sometimes ship via UPS but its size and weight make UPS shipping expensive. Call us with any shipping questions @ 866-352-7108.